Records for 24,874 women: The results of this study show that the use of cannabis in pregnancy is associated with increased risk of adverse birth outcomes. Prevention programs that address cannabis use during pregnancy are needed. Multivariate analysis, controlling for potential confounders, including tobacco smoking, alcohol consumption, and use of other illicit drugs, showed that cannabis use in pregnancy was associated with low birth weight, preterm labor, small for gestational age, and admission to the neonatal intensive care unit. Cannabis has enormous affinity for milk and produces a milk/plasma ratio of 8, although the levels in milk are generally considered subclinical. THC crosses the placenta readily, and there is increasing evidence that it may increase rates of growth retardation and adverse neurodevelopment following prenatal exposure. One study indicated an increased incidence of reduced head circumference in young adolescents (9-12 years of age) who were exposed in utero to heavy marijuana use. Prenatal exposure resulted in a higher rate of low birth weight infants and childhood leukemia. Recent studies have suggested a reduction in long and short-term memory retrieval and retention in children exposed to prenatal cannabis. These children were also weak in planning, integration, and judgment skills. 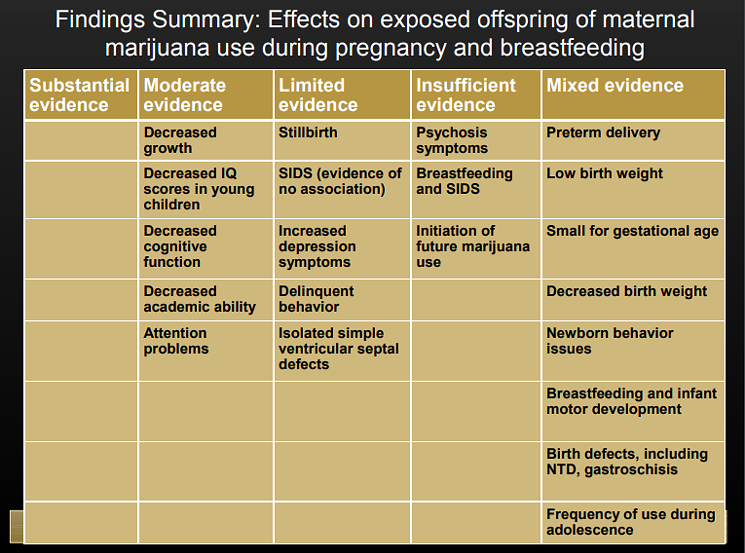 While the effect of cannabis on infants from breastfeeding mothers is limited, cannabis use in breastfeeding mothers should be strongly discouraged. Thus, in pregnant and breastfeeding mothers, this drug should no longer be viewed as safe. Data suggest that administration of THC during pregnancy can induce long‐term structural and functional modifications of the cortical circuitry. Therefore, disrupted temporal and/or spatial precision of cannabinoid receptor activation, especially due to in utero cannabis exposure, can destabilize finely tuned signalling networks resulting in altered brain circuit formation and sensitivity to secondary insults. "We found moderate evidence that maternal use of marijuana during pregnancy is associated with negative effects on exposed offspring, including decreased academic ability, cognitive function and attention. Importantly, these effects may not appear until adolescence. My main finding is that it's primarily women who were younger when they become mothers who do continue to use marijuana overtime. Also women who are depressed over longer periods of time, women who smoke, women who use more than the recommended amount of alcohol are more likely to continue to use marijuana while pregnant as well as when they're raising their children. So the take-home messages is to ask women about marijuana use. We know that marijuana use is considered more and more acceptable by women and that they may continue to use while they are pregnant and while they are having children. But at a bare minimum, these findings suggest we should be avoiding recreational cannabis use during pregnancy. Children whose mothers use marijuana during pregnancy have a higher risk of stunted growth and of developing ADHD, anxiety, and depression later in life. When THC enters the body, it interferes with endocannabinoid’s actions, competing with it for binding sites on target cells and generally getting its way. For the researchers of the study, the results present a “a major public health concern” as a number of pregnant women would report taking marijuana to alleviate morning sickness or nausea – without knowing of the adverse side-effects. Marijuana increases the risk of spontaneous preterm birth independent of cigarette smoking status and socio-economic status. Women who continue to use marijuana at 20 weeks’ gestation are five times more likely to deliver preterm than those who do not. The rate of early SPTB is higher amongst women who continue to use marijuana at 20 weeks’ gestation. Summary: Cannabis use during pregnancy is associated with abnormal brain structure in children, according to a new study. Compared with unexposed children, those who were prenatally exposed to cannabis had a thicker prefrontal cortex, a region of the brain involved in complex cognition, decision-making, and working memory. Connection between legalization of marijuana and increase opioid addiction. The effects of marijuana on the brain of an unborn child. Predisposing children for addiction. Here are the studies cited. In a new study, researchers in London, Ontario found that women who used marijuana while pregnant were almost three times more likely to have an infant with low birth weight than women who did not use marijuana. Researchers had two women conduct "mystery caller" phone conversations with employees at 400 dispensaries across the state, telling them that they were eight weeks pregnant and suffering from morning sickness. During the majority of those calls, the employees recommended the women use cannabis products.